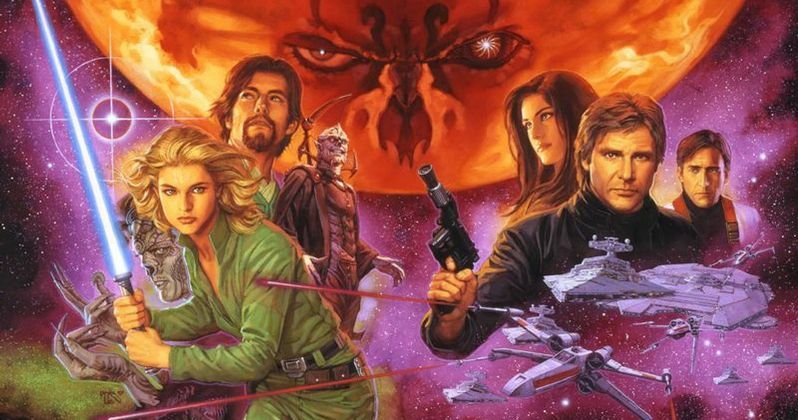 A major sticking point for longtime Star Wars fans when Disney purchased Lucasfilm has been the decision for the company to abandon the Expanded Universe in 2014. Nearly everything that wasn't a theatrically released Star Wars movie was abandoned, save for the Clone Wars animated series. So why did Lucasfilm do it? One man has an explanation for us. Leland Chee is part of the Lucasfilm Story Group, a group tasked with making sure everything in the official Star Wars canon is accurate and lines up. While he didn't join Story Group until after the decision was made to abandon the Star Wars Expanded Universe, he says that, from his perspective, the decision came down to the fact that Chewbacca had been killed in a comic book. Here's what he had to say about it. "For me it came down to simply that we had killed Chewbacca in the Legends, a big moon had fallen on him. Part of that [original decision] was Chewbacca, because he can't speak and just speaks in growls, he was a challenging character to write for in novels. Publishing had decided they needed to kill somebody, and it was Chewbacca. But if you have the opportunity to bring back Chewbacca into a live action film, you're not gonna deprive fans that. There's no way that I'd want to do an Episode VII that didn't have Chewbacca in it and have to explain that Chewbacca had a moon fall on his head. And if we were going to overturn a monumental decision like that, everything else was really just minor in comparison." Lucasfilm has made it clear that every novel, comic book, video game, TV series and movie that debuts after the Disney deal is part of the Star Wars canon now. So if they had kept the Expanded Universe as was, that means they wouldn't have been able to use Chewbacca in Star Wars: The Force Awakens or Star Wars: The Last Jedi. Despite his comments in this interview, Leland Chee took to Twitter to make it clear that his comments were genuine, but he wasn't with Lucasfilm Story Group when the canon was reset. "I had a great time talking Star Wars with Fandom Files. As for the EU reboot, that was a decision made long before I joined the Story Group." Good and bad has resulted from the reset of the official Star Wars canon. Now, things aren't nearly as messy. Before, there was nobody overseeing everything that was released, so there were a lot of really wacky stories out there and not everything really lined up. And via Star Wars Rebels and other parts of the new canon, characters like Thrawn have found a path to resurrection from what is now referred to as Legends to the new canon. Ultimately, it probably wasn't just Chewbacca that caused for the canon reset, but that's a shining example of why, as frustrating as it may have been for fans, this needed to be done. For more with Leland Chee, you can check out the full interview over at SyFy.